Remember our first indoor flying experience at iFly Singapore earlier this year (you can read about it here), today we share with you 50 things that you do not know about iFly Singapore. 1. The official opening of iFly Singapore on 18 May 2011 was officiated by former foreign minister, Mr. George Yeo! The guest-of-honour suited up in his own personalised red flight suit and helmet, and flew in the wind tunnel with the rousing support of invited guests. 2. Vertical wind tunnels were initially created to test aircraft spins, helicopter blades, and parachutes. These days, they are very popular in realising people’s dream of flight and are used by pro-flyers to train and compete in the sport of body flying. 3. iFly Singapore is the first wind tunnel in the world to be accredited with the ISO 9001 and OHSAS 18001 standards. These certifications ensure that every possible step has been taken to safeguard that the customer’s flight experience is undertaken in a risk-free environment. 4. iFly Singapore is the world’s first themed wind tunnel! The entire body flight facility is themed like an airport terminal and offers a consumer flight journey unlike any other wind tunnel! 5. When vertical wind tunnels were first introduced, it served as a valuable device for skydivers as they were able to learn the skills required to become better skydivers and train in all disciplines of flying. 6. The military uses vertical wind tunnels as an important part of their training regimen in order to better prepare and train for military applications. 7. A traditional freefall typically lasts no longer than 50-60 seconds, so the goal of a wind tunnel is to create a smooth, laminar flow of air which enables skydivers to practise for an unlimited period of time. 8. Popularity of indoor skydiving amongst the public grew after the use of vertical wind tunnels during the closing ceremony of the 2006 Winter Olympics, which were held in Turin, Italy. 9. The oldest person to indoor skydive is an adventurous 103 year old lady from Florida. 10. There’s four positions of body flight. First time flyers will experience ‘Belly Flying’ which is a basic position where one flies with the belly prominently exposed to the wind. 11. At most indoor skydiving facilities, the first time flyer experience lasts 1 and a half hours, and the flight experience takes just as long as it would take for a traditional skydiver, which is like falling through the air from 12,000 to 3,000 feet, twice! 12. The stainless steel elastic net located at the base of most wind tunnels is strong enough to hold two adult elephants (or 200 people of 100kgs each)! 13. iFly Singapore is the largest indoor skydiving wind tunnel in Southeast Asia and is able to accommodate up to 20 professional flyers at one time! 14. Many with Acrophobia (fear of heights) use indoor skydiving as one of the way to overcome their fears. 15. The slightest adjustment of your appendages causes your body to go up, down, or move laterally in a wind tunnel. 16. To date, iFly Singapore has an impressive record haul of 10 Guinness World Records titles under its belt. 17. iFly Singapore recently made it into the list of TripAdvisor’s 50 iconic places to visit in Singapore and was awarded the 2015 Certificate of Excellence for its impeccable customer service. 18. The Guinness World record for the longest indoor freefall of 4 hours 22 mins and 20 secs, which is equivalent to falling from a height of 2,766,720 feet or 843,296 meters through the air, is held by iFly Singapore. 19. 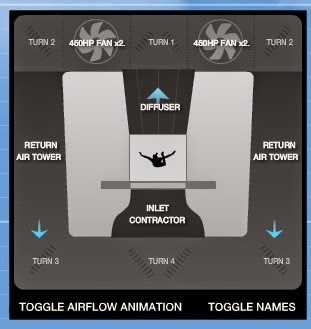 Recirculating wind tunnels use powerful fans to produce an upward air flow capable of levitating human beings. Did you know? The wind is actually generated from above, not below, the air chamber! The fans are mounted in the upper segment of the tunnel, and wind is funnelled down the sides where it flows underneath the chamber then up again through the mesh floor, which then lifts the flyer into the air. 20. As it is near impossible to hear amid wind blowing more than 100 miles an hour, indoor skydivers communicate using hand signals inside the wind tunnel. 21. According to a research conducted in the UK, indoor skydivers can burn up to 325 calories for every 26 minutes spent in the wind tunnel. 22. An indoor skydiving instructor can expect to burn nearly 2,000 calories a day – that’s equivalent to burning three-and-a-half Big Macs! 23. Indoor skydiving makes for an all-rounded exercise as it utilises almost all the muscles in the body at one time, similar to swimming. 24. Most first time flyers experience a huge adrenalin rush as their first time in the wind tunnel triggers the release of serotonin, or the "feel good" hormone, in the brain. 25. The first indoor skydiving world championships in Asia Pacific was held at iFly Singapore in 2012 and saw some 400 competitors from more than 10 countries, and a prize pot of $150,000. 26. ‘So You Think You Can Fly’ is the first ever indoor skydiving YouTube reality series, launched by iFly Singapore. The charity initiative featured a series of 5 webisodes that documented the training of 5 local celebrities going through the training of indoor skydiving to win cash and prizes, fund by iFly Singapore, for their elected charity. 27. 13 is the number of Most Skydivers in a Wind Tunnel, according to the Guinness World Record and is held by iFly Singapore. The 13 skydivers consisted of 12 children and one adult who flew for a total of 5 minutes. 28. At present moment, there are over 130 vertical wind tunnels available around the world! 29. The International Bodyflight Association was founded with a mission to promote safety in the sport of indoor skydiving and to host events and competitions to take the sport to new levels. Today, indoor skydiving has become its own entity outside of traditional skydiving. 30. Cordura is a common type of material used on indoor skydiving flight suits. It is a durable synthetic fabric recognized for their long-lasting durability and resistance to abrasions, tears and scuffs. 31. The first Singaporean to propose marriage in the wind tunnel at iFly Singapore was in 2011. The bride-to-be was literally swept off her feet by the surprise! 32. The Most Head Spins in a wind tunnel in one minute is 50, and was achieved by a flight instructor Jonathan Loh, from iFly Singapore on 21 May 2015! 33. The area above and below a flyer in reference to the wind is called the “burble”. This area is essentially a low-pressure area which gives a feeling of low/no-wind when flown through. 34. Competitive indoor skydiving, also known as body flight, shares many of the disciplines of competitive skydiving, such as formation skydiving and freestyle skydiving. 35. Free fly and Freestyle are known as artistic skydiving disciplines. Flyers use both horizontal and vertical flying axis and choreograph a flowing routine. 36. During indoor skydiving competitions, athletes compete to successfully complete a certain number of manoeuvres in an allotted amount of time. Athletes can compete as teams, working to complete manoeuvres and grips, or as individuals. 37. Most indoor skydiving flight suits are customised with grab handles, called grippers, to make it easy for the instructors to assist the flyers. 38. When you visit an iFly indoor skydiving facility, after your flight you will receive an Indoor Skydive Certificate showing what components you mastered! 39. The free fall sequence seen in movies such as ‘Quantum of Solace’ was performed by the actors doing indoor skydiving! Other movies include CZ12 by Jackie Chan! 40. iFly Singapore is a great place to spot celebrities! International celebrities from Zhang Ziyi to Michael Schumacher have been spotted taking flight. Even Emeritus Senior Minister, Mr Goh Chok Tong visited the facility with his family. 41. The Red Lions, those daredevil freefallers who have been a fixture at every National Day Parade since 1996, practice their leaps indoors at iFly Singapore! 42. Since opening in 2011 iFly Singapore has flown over 180,000 visitors. That is more than 135,000 hours of flight time clocked in the wind tunnel! 43. Indoor skydiving may have only gained popularity in recent years however the sport has been around for years! The first human to fly in a vertical wind tunnel was in 1964! 44. During the 28th SEA Games Opening Ceremony in Singapore in 2015, Nila, the mascot, skydived into the stadium and he trained for his grand entrance into Singapore Sports Hub at iFly Singapore! 46. The first human flight at iFly Singapore is by none other than Mr Lawrence Koh, Founder and Managing Director of iFly Singapore, on 26 Nov 2010. 47. To mark iFly Singapore’s 4th anniversary and to commemorate the nation’s 50th birthday, the iFly Singapore team attempted 5 Guinness World Records in under 30 minutes! 48. Due to the lesser surface area presented and their flight experience, flight instructors are able to stand in the wind tunnel! The more surface area you present to the wind, the slower you will fall. The less surface area you have, the faster you will fall! 49. Flying should not impair your breathing abilities. Some first time flyers claim it is hard to breathe, as they are often holding their breath. Relax and remember to breathe when you are in the wind tunnel! 50. The wind tunnel is a great way to learn about science, physics and aerodynamics. iFly Singapore’s very own youth ambassadors, Team Firefly- Kyra Poh and Choo Yi Xuan are featured in the local physics textbook! So, after reading the above Fun Facts about iFly Singapore, I bet you are all pumped up to give it a try. Book your flight here, go down to iFly Singapore, gear up and re~lax~~~ like what DinoBoy is doing in the phto. Enjoy the indoor flying experience~~ and be back for MORE! 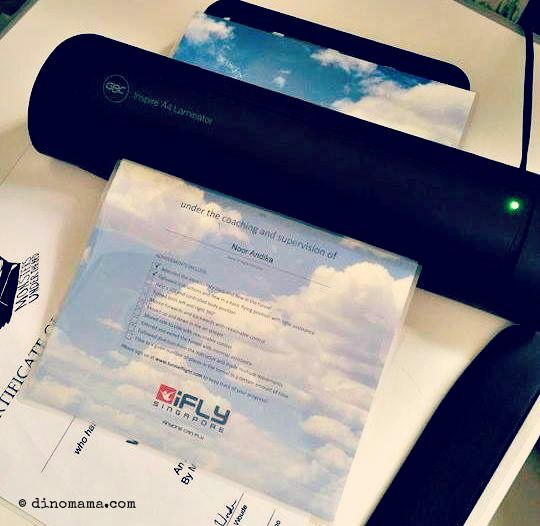 Disclaimer : We were invited by iFLY Singapore for another round of indoor flying experience for the purpose of this post & giveaway, no other forms of compensation were received. All opinions are 100% ours and all photos in this post unless otherwise credited, are copyrighted and belongs to the DinoFamily, you may not use any of the photos for any purposes without seeking our approval. I wanna try it eh! 5 famous people are Mr George Yeo, ESM Mr Goh Chok Tong, Actress Zhang Ziyi, F1 driver Michael Schumacher and our Nation's Red Lions. Celebs from Mediacorp: Randall Tan, Dr Jia Jia, Hayley Woo, Munah, and May. 5 famous people who suited up and flew in iFLY are Zhang Ziyi, Michael Schumacher, Jackie Chan, Randall Tan & Hayley Woo. The 5 famous people who suited up and flew in iFLY are Zhang Ziyi, Michael Schumacher, Mr Goh Chok Tong, Jamie Yeo and Denise Tan. I'll like to win this for my hubby! The 5 famous people are Mr George Yeo, ESM Goh Chok Tong, Actress Zhang Ziyi, Michael Schumacher and the Red Lions! The 5 famous people include our own Mr George Yeo, Jackie Chan, Zhang Zi Yi, Michael Schumacher and Mr Goh Chok Tiong!